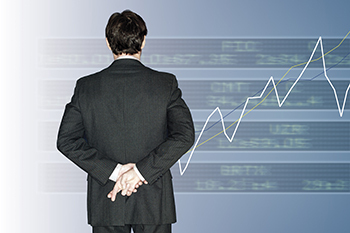 Technical Analysis is the forecasting of future price movements based on the assessment of past price movements. It doesn’t result in complete predictions about the future price. Instead, technical analysis can help investors anticipate what is “expected” to happen to prices over time. Technical analysis is the art of using historic price movements of a stock/index to get direction of future price trends. More than absolute prediction it aids traders to get an indicative on price of a stock/ index in short term. Price - The market price is the current price at which an asset/share/commodity can be bought or sold. It is the highest amount a buyer is willing to pay for a particular stock. Volume – Volume is one of the most basic and most beneficial parameter to understand while reading a stock/index chart. Volume is the total number of shares traded in a particular stock throughout a specific time. A drastic change in traded volumes can indicate a rise or a fall in prices. Trend – After volume, trend is the second most essential tool for a trader. A combination of trend and volumes aids the trader to decide on whether to enter or exit a particular trade. 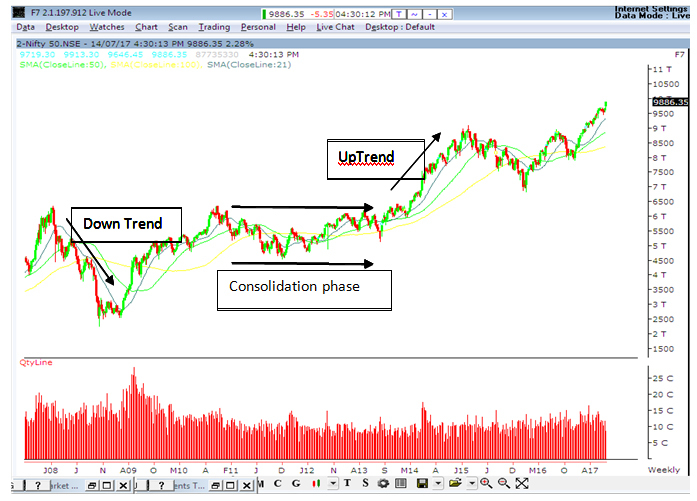 Trend is basically classified in three types, uptrend, downtrend and sideways trend or consolidation. In an uptrend, price moves higher. In this case every high is higher than its previous high. In a downtrend, price moves lower. In this case every low is lower than its previous low. In consolation, prices move in a specific trading range. 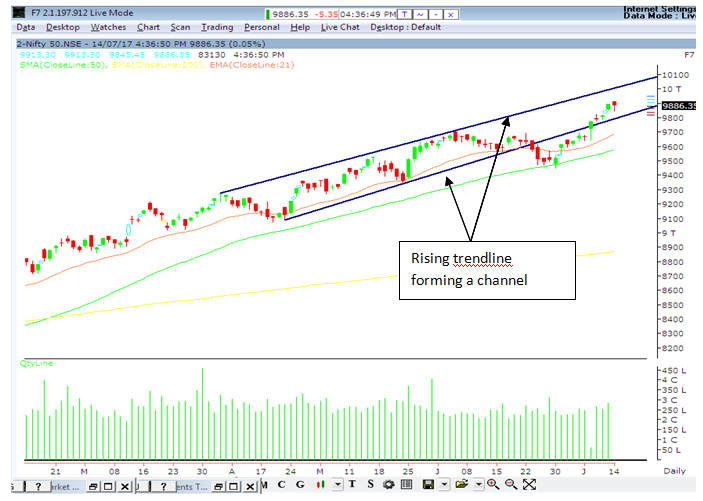 Trendline – The oldest and easiest way of determining the trend is with a "trend line." 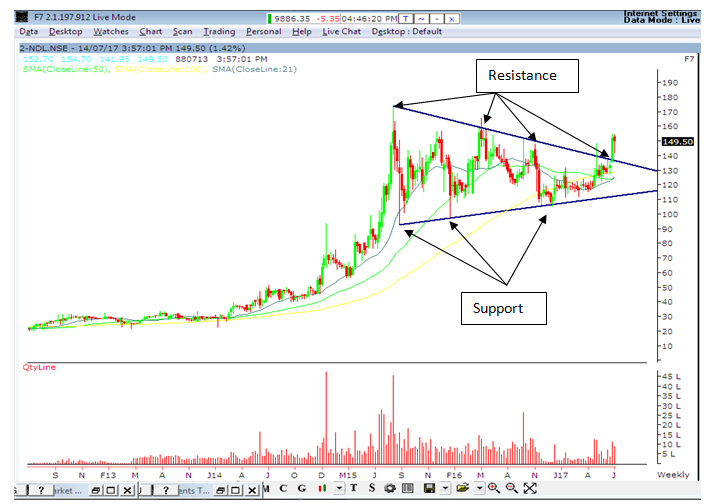 All that is required is two support points to draw an uptrend or two resistance points to draw a downtrend. Support level is the price around which previously, a particular security/commodity finds incremental demand. Traders use this level to enter the stock. 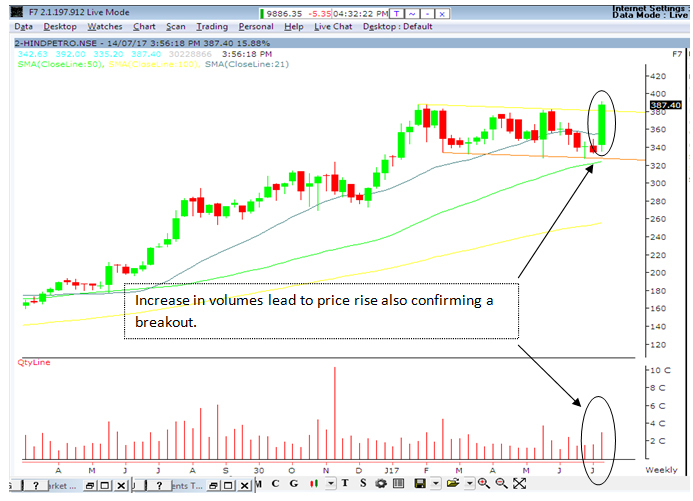 Resistance level is a price around which a stock finds incremental sellers. Traders use these levels to exit a long position or even short sell a security.